MWHC was retained by Reclamation District 2035 (RD2035) to provide design and construction management services for a new $49M intake facility located on the Sacramento River near Woodland, CA. The new facility provides water to irrigate over 15,000 acres of crops and serves the residents of the cities of Davis and Woodland, as well as the campus of the University of California, Davis. The intake features a complex fish screen system specially designed to protect the endangered Chinook Salmon, Steelhead Trout, and North American Green Sturgeon that migrate past the site. 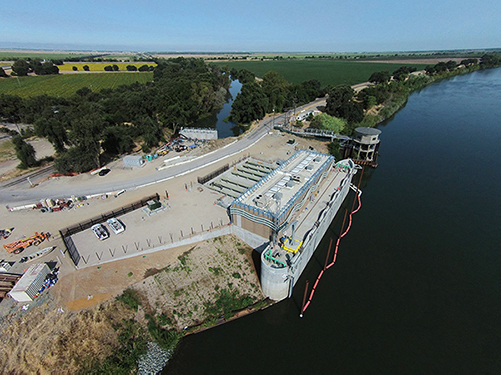 The new facility replaces RD 2035’s existing intake, which had been in operation since 1920, and was the largest unscreened intake on the Sacramento River. The new facility can move 400 cubic feet per second (cfs) of river water, operating under two sets of hydraulic conditions. The water for RD 2035 irrigation is pumped a short distance to an open irrigation canal system, while water to Woodland and Davis is pumped into a new pipeline and travels approximately 4 miles to a regional water treatment plant. As part of the demolition of the existing intake facility, the scope of work including the temporary relocation of County Road 117, and the excavation and removal of a 6-ft-by-6-ft concrete conduit through the Sacramento River levee. Concerned about the cost of the work and excavating through a 100-yr-old levee, MWHC and the Owner worked with the US Corps of Engineers and the Central Valley Flood Protection Board (CVFPB) to allow the existing concrete conduit to be left in place. After a six-month submittal and review process, the CVFPB amended the in-levee construction permit to allow the concrete conduit to remain in place through an interior cellular grouting and exterior permeation grouting program.